If you have clicked on this page then hopefully by now you will have tried out some of the CBT techniques on this site and are experiencing the positive effects that CBT can bring to depression symptoms. Behavioural activation, problem solving and thought challenging are all effective CBT treatments for depression, and if they are working for you then we want to spend some time understanding how they can become strategies for life, and not something that we forget about when things are difficult. This article looks at what we mean by Relapse management, also sometimes called relapse prevention, and at how by paying attention to the process of recovery from depression we can apply the right strategies at the right time to keep us moving forward. The Stages of Change model, also sometimes called the transtheoretical model, was developed by Prochaska and Diclemente in the 1980’s as a way of explaining the stages that people go through when making changes in life. Although it was originally applied to smoking behaviour, and later other addictive behaviours such as substance and alcohol use, it is also a great way of understanding where you are when making changes in depression. By understanding where you are, and where you have come from, on the model you are able to direct appropriate resources to maintaining change and to move through stages. For instance, we might say that someone who has been thinking about getting in shape for some time but not actually done anything about it yet would be in the contemplation stage. For them to move forward with change would require them to make a diet plan or contact the local gym to enquire about membership – the planning stage. Further, for them to then progress into the action stage, they would be putting their diet plan into action, or actually getting to the gym. The elements of the model that I personally find most useful are those that explain how we respond to lapses and relapses in behaviour change. 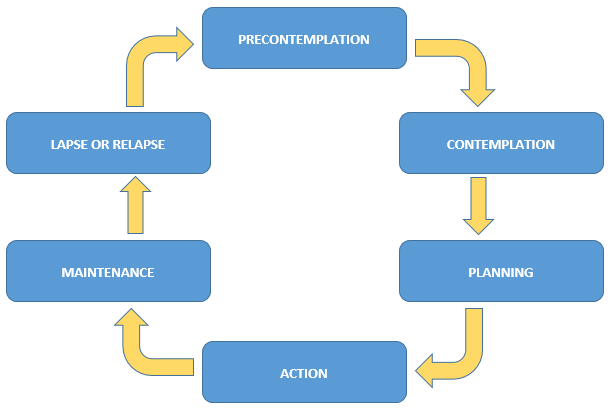 The model makes a distinction between a relapse, in which the individual stops sticking to the chosen behaviour change entirely and returns to the precontemplation or contemplation stage (i.e., they give up! ), and a lapse, in which the person briefly stops sticking to the behaviour change but then gets back to change by moving to the planning or action stages. Of course, lapses are preferable (and extremely normal), but by also helping us to understand the factors that led to past relapses we are then able to consciously make decisions about how we might want to change in the future. Precontemplation: This is the stage at which we have no desire to change the given behaviour. We may have been engaged in the behaviour for some time and do not see it as a problem or as something that we would like to change. Contemplation: This is the stage at which we start to think about making a possible change. We may be influenced by external factors or just decide that it is time to do something about the behaviour. In the case of depression, we may move into this stage as a consequence of a loved one suggesting that we are not our usual self, or from seeing a leaflet about depression. There is no actual physical change occurring at this stage. Planning: When we have developed enough motivation at the contemplation stage, we may eventually move into the planning stage. At this stage we will plan what kind of resources we may need or strategies we may need to adopt to bring about the desired change. In the case of depression management, planning may mean you accessing this site, setting treatment goals and deciding which of the exercises would be most applicable to you and your particular needs at this time. Action: You guessed it, the Action stage of the model is where we actually start to implement the actions required of us to make the change. Behaviours we may adopt in depression may include using our thought record, sticking to an activity schedule or trying out a new behaviour designed to solve a particular problem. Maintenance: When the Action has been established, the individual will then progress into the Maintenance phase. This, in my experience, is the phase that is possibly the most significant but which is often overlooked. Here, the behavioural changes that we have put into place can become more automatic, and as a consequence may be subject to less effort, which can lead to us forgetting how helpful they are in the first place. By understanding where we are in relation to the stages of change model, we can choose to plan and modify our actions to maintain the desired behaviour. It is equally important to understand how to respond if we do have a moment in which our desired behaviour does not get carried out. There are two ways of looking at this; Lapse and Relapse. Lapse: A short term blip. It is incredibly likely, inevitable in fact, that at some stage in your recovery you will experience a difficult, challenging or emotionally painful day. This is part of being human. What it doesn’t mean however is that you are back to square one with your depression. It’s just what it is – a bad day (or even a bad few days). At this stage it is important to be compassionate to yourself and to continue using the strategies that have worked for you as soon as you are able to do so. Within the Stages of Change model, a Lapse sees us return to the planning or action stages and continue with our desired behavioural change, learning from our Lapse as we do so. Relapse: As above, difficult and challenging days are inevitable. A relapse occurs when, instead of continuing to implement the behavioural strategies that have helped you to cope, you stop taking action and return to the Precontemplation stage of change. We may be thinking, “this is no good, I can never get better” and stop taking any action entirely. Essentially, we have given up and it may be some time before we move into the latter stages of change again. Strategies for maintaining positive change. Select one day each week in which you will purposefully take the time (ideally 1 hour) to evaluate your mood over the previous 7 days and constructively decide what other actions might need to be taken. You could use this time to review your behavioural activation diary for the past week, or to schedule further positive activities. You may wish to identify and evaluate your hot thoughts in relation to an argument which took place between you and your spouse, or to problem solve an issue which leaves you feeling stuck. This is not a time for rumination or worry, but instead a time to actively evaluate recovery. Take out your diary now and highlight one hour on one day each week to be singled out just for this. What challenges have I handled well this week? What techniques/strategies did I use to do this? What challenges didn’t go as well as I would have liked this week? What techniques/strategies could I have used to improve the outcome? What do I need to put in place to get the best out of next week? Have a few, proven behavioural strategies which can enable you to switch mood quickly. Ideally this is something which is of low importance and accessible easily. For instance, I know that one of my own quick wins is literally 20 minutes of blowing stuff up on Xbox – it requires some degree of attention so it will interrupt rumination and worry, it is definitely not important and might just lift my mood (if I don’t take it too seriously!) Similarly, some men might choose to kick a football about outside for 15 minutes, or make a phone call to someone they know will take their mind off things. Whatever it is, the idea is that we have an almost instant behavioural and cognitive change away from the depression which we are feeling, really useful when we are having a particularly low day. From this we can then move into more active problem solving to assist with our mood. With the help of your completed Activity diary 1, make a list of 5 brief, largely unimportant, techniques that you can have to hand to interrupt distress whenever you need to. A 5 minute breathing exercise, a game on your mobile phone or the contact number of someone you can let off steam to are all examples of “quick wins” that can keep us on track. Keep the list somewhere accessible so you can get to it when you need to. There are some situations which will serve as inevitable triggers for low mood. A disturbed night’s sleep, an argument with someone close, criticism at work or just not being able to catch some time for yourself are all examples of situations that can activate negative feelings. This is ok and to be expected – we all have these. What is useful to do when managing recovery however, is to plan for these events. You will know from using thought records the types of events that will trigger low mood and so will be in a position to use problem solving to decide how you can choose to act when these situations arise. Take some time out today to think about what types of situations may present as “Red Flag” situations for you. It might be helpful to look through your thought record, or even look ahead on your calendar for upcoming events that you may need to plan for. You will know the types of day to day events that need particular attention (e.g., having to go to work after a disturbed nights sleep, or having had an argument with your partner), but it can also be helpful to look for the more unusual events (family gatherings, holidays, illness) that can become triggers for low mood and consider problem solving these also. The goal here is not to worry about future stressors, but to develop a practical strategy for dealing with inevitable challenging situations. So there we have it, relapse prevention in a not-so-nutshell. It’s important to remember that recovery from depression is a process and not and end-goal. Bad days will happen, but they are not the end. Get back to planning and taking action as soon as you possibly can and develop resilience to depression with each lapse. Good luck.